If you want to have a full control on your website, Realty House is the best choice for you and your business. Realty House has 4 different layouts for property listings to select the best for your website. Do you need to submit your property? Just click in Submit Property button in header to be redirected to a greate and beautiful front-end submission page. Realty House provides a great view to enable you to compare as much property as you need in all features to choose the best one. 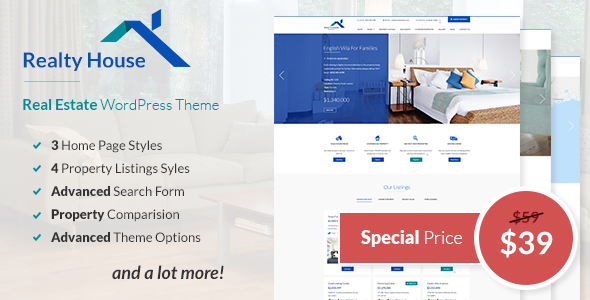 You can bookmark any properties by this theme without any limitation, there is no matter if you are logged-in or not. You can manage ALL fields and sections of every search property forms of your website. By help of the advanced theme options we have provided for Realty House, you can dynamically manage all sections of website without having any knowledge about coding. We have designed 6 real estate widgets for this theme to be used in any sidebars of the website. These 19 Shortcode will enable you to create several pages without any limitation in design. By this great feature of Realty House, you can mark one property for more than one agent. Are you interested in submitting your properties in the website? Do not worry just register as an agent to use submit them and several options of website. By help of this system users can rate an agent and it is a good way to recognize the best agents of your website in usersâ€™ views. Shortcode wizard enables you to add/manage shortcodes of a page/post in a wizard UI. Just fill the forms and insert the shortcode in your content. You can switch the currency of website by help of its select box in header of website. All the prices will be updated to the todayâ€™s rate of currency by changing the value of currency changer. Realty House was developed in a way to be compatible with WPML and we have provided required language files to be translate to ANY languages you need. We have customized the Google Mapâ€™s styles based on Realty House style, also we have provided some good feature for that like Info Box and etc. If you have lots of properties on your website, Google Clustering system is a good choice for you to make the maps more cleaner. We have coded a section called Fun Facts, it is used to show some statistics about your website and the status of your properties in it. We have collected lots of real estate icons in our themeâ€™s package to be used in any sections of your website. Realty House fully supports all devices like PC, Tablets and Mobiles. Try the responsiveness of our template by resizing the browsers in our Demo website. Retina devices will show the template with the best quality. You need to present your website and its services by a video? You can show all of your YouTube uploaded video in this theme by help of its shortcode wizard. We have tried to answer all userâ€™s questions in themeâ€™s documentation. Please check it before any customization or changing in theme. Realty House will be shown in the best way in all common browsers. Customization is in easiest way by using theme options and child-theme. If you are confused for setting the website up, importing our demo web-siteâ€™s content in your website will help you. With child-theme you can customize Realty House without changing any codes the main theme. You need more? Have any questions? We will fully support you.